For ages 13 and older in the Santa Fe Room. Watch “Crazy Rich Asians,” on the big screen at the library, Popcorn provided. Rated PG-13. For adults in the Santa Fe Room. Call 865-1340. March 24: The Guernsey Literary and Potato Peel Pie Society” by Mary Ann Shaffer and Annie Barrows. April 25: “My Grandmother Asked Me to Tell You She’s Sorry” by Fredrik Backman. For grades 6-12 in the Frisco Room. If it’s Friday night, there’s something going on at the Station just for teens. Stop in weekly for games, crafts and special events. Materials will be provided. Call 865-1340. For families with children in grades K-6 in the Story Hour Room. Come and create using your imagination and a range of artistic styles and mediums. Materials will be provided. Learn about radial symmetry by weaving on recycled CDs. Call 865-1340. For adults in the Frisco Room. Don Smith, education director for the History Museum on the Square, will provide an in-depth look at the history and culture of the Osage people through multi-media and artifacts. Tracing the history of the Osage from their arrival in the area to present day, the presentation will include authentic clothing, music, language and other cultural items that reflect the unique and fascinating ways of life of early Ozark Native Americans. Call 865-1340. Residents and/or property owners in the Doling neighborhood are invited to participate in the spring neighborhood clean-up. The City and the neighborhood association encourages residents to take advantage of this free and convenient opportunity to dispose of trash, brush, metal, tires and TVs. Residents are encouraged to address overgrown fence rows, backyards and alleys adjacent to your property by mowing, cutting down, trimming and disposing of all brush and related debris. 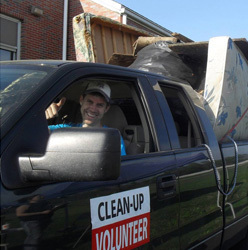 Each year, neighborhood clean-ups serve approximately 900 households and remove over 175 tons of bulk waste (furniture, mattresses, etc.) and brush from Springfield neighborhoods. The clean-ups take place outside, rain or shine. Items accepted are trash, brush, tires, TVs and metal. Curbside pickup is available, but fees may apply. To schedule a curbside pickup, please contact Christina Dicken at 417-841-7273. For families with children from infants-grade 12 in the Children’s Department. May the fourth be with you as you drop in for a galaxy of games, crafts and other “Star Wars” surprises! Don’t miss “Star Wars” Storytime at 1:30 p.m. for age 2-grade 2 with stories, songs and lightsaber practice in the Story Hour Room. Costumes are encouraged. Call 865-1340. For senior adults at the Northview Center, 301 E. Talmage St. Join us at the Northview Center in Doling Park for this library-sponsored book group just for seniors. Call 865-1340. April 12: “The Last Ballad” by Wiley Cash. May 10: “Before We Were Yours” by Lisa Wingate. Meetings are the second Tuesday of each month at 6:45 p.m. at Hillcrest Presbyterian Church, 818 E. Norton Road. Optional potluck begins at 6 p.m.
Download the Know Your Neighborhood demographic snapshot (pdf) for Doling.